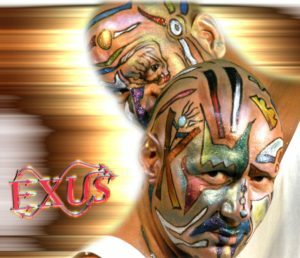 EXUS (pronounced eh-shews) was the music collaboration of two international music composers and performers: Kuut (UK) and Saint (Brasil) between the years of 2001 and 2006. Disillusioned with the state of regular club culture and music it was time for something altogether different. Bending the genre boundaries and music production techniques of the time the music was produced in the most creative way possible in order to break away from traditional song structure and writing/production styles. It has been to this day the most creatively freeing musical journey of my lifetime. I would not be writing the music I am now without these years of experience at bending the norm, and for that I am forever grateful! Together as EXUS , Saint and Kuut created a massive discography of over 440 songs and 14 albums. They performed live in concert in South America, North America and Europe. Their music spans a range of styles including the best elements of pop, electronic, rock, alternative, dance, world and even ambient. The music of EXUS is truly diverse and unforgettable, which led fans to name their music Dimensional Sound.